It’s a glorious time of year, and there’s no greater feeling than sharing the excitement with those we love. 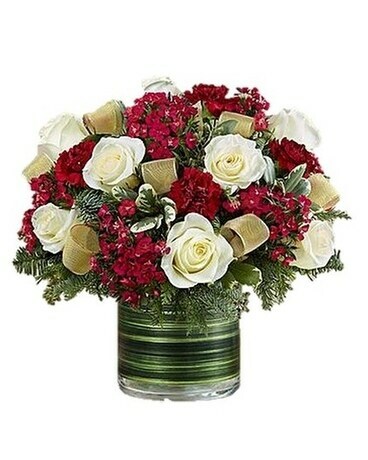 Our classic Christmas arrangement is artistically hand-designed with warm, rich burgundy & white blooms and trimmed in elegant gold ribbon. Gathered inside a clear vase lined with lush green leaf ribbon, this beautiful gift will fill their home with holiday spirit & style.